Bodies are piling up in Bujumbura, the capital city of Burundi, and now Welly Nzitonda, the son of a prominent human rights defender Pierre-Claver Mbonimpa was found dead in the streets on Friday. It's believed that these people were killed by government security forces under orders of the Hutu president Pierre Nkurunziza. Burundi and Rwanda fought an extremely bloody civil war between ethnic Tutsis and Hutus in the 1990s, climaxing in 1994 when close to one million Tutsis were killed by Hutus in a three-month period. Nkurunziza took office in 2005, and has served for two terms, which is the maximum allowed under the country's constitution, written during the post-war Recovery era with the intention of preventing another civil war. Many people fear a return to full-scale violence between Hutus and Tutsis, as in the 1990s. From the point of view of Generational Dynamics, that's impossible, since there are too many survivors of that horrific genocide still alive to ever allow it to happen again. What's going on in Burundi today is quite different. The violence today is coming from the politicians, not from the people. Nobody is picking up a machete and killing the family next door. What is happening is that, apparently, government security forces are going around killing anyone who opposes the government. Several days ago, I wrote a long analysis of the different types of civil wars. 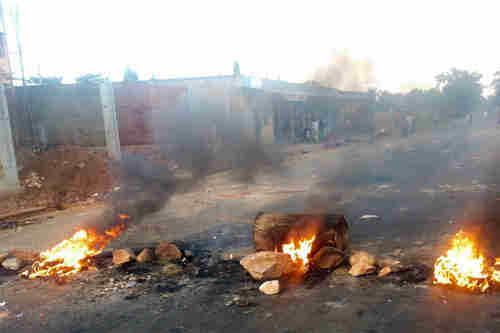 What's happening in Burundi today is that the crisis civil war between Hutus and Tutsis ended, and now the Hutu leaders are using violence to stay in power, allegedly because they fear a return to civil war. Nkurunziza has not yet resorted to full scale genocidal violence against his political opponents, but he's on that path, and may be using Zimbabwe and the savage monster Robert Mugabe as models. Mugabe's 1984 pacification campaign was known as "Operation Gukurahundi" (The rain that washes away the chaff before the spring rain). During that campaign, accomplished with the help of Mugabe's 5th Brigade, trained by North Korea, tens of thousands of people, mostly from the Ndebele tribe, were tortured and slaughtered. Later, Mugabe single-handedly destroyed the country's economy by driving all the white farmers off the farms, resulting in one of the biggest hyperinflation episodes in world history. The Kurdistan Workers' Party (PKK) militant group in Turkey issued a statement on Thursday ending a unilateral ceasefire that they called in early October. The PKK statement said that they had hoped that Turkey's president Recep Tayyip Erdogan would soften his position towards the PKK once his party had won last week's parliamentary relation. Instead, Erdogan followed the election by saying that the war against the PKK would continue until they all surrender. On Thursday of this week, Erdogan gave a strident speech renewing the threats of violence until every last militant was "liquidated." "Prior to the election, we took a decision for a cessation of action. Despite all the attacks, we maintained this resolve, with one-sided patience. No doubt the fate of this decision of ours was going to be dependent on the stance of the Turkish state. The behavior of the AKP government, and the attacks that have been carried out, have made it plainly clear that the unilateral cessation of action cannot be maintained. Consequently, with the AKP's war policy and the attacks that have taken place, the unilateral cessation of action has ended." "The occupation of one third of Iraq, and also vast areas of Syria, by Daesh [ISIS] has undoubtedly created one of the most serious challenges. Rest assured that Turkey is steadfast in its support for Iraq and the KRG in the fight against terrorism. We will continue our assistance to ease the suffering of so many IDPs and refugees, who have become victims of a vicious terrorist organization."